In the late nineteenth century the Arak region of Persia catered especially to western markets, with the London firm of Ziegler established in the town of Sultanabad to supervise the design and manufacture of the finest Mahal or “Sultanabad” carpets. Though often boldly monumental in their drawing and effect, Sultanabad’s nonetheless drew upon a classical Persian design tradition, as this extraordinary example shows so well. The field has a grand trellis vinescroll design or ‘Herati’ design, emerging from bejeweled vases reminiscent of the great Safavid court carpets of the seventeenth century. Here the large sickle-shaped leaves are faithful to the early, classical rendering of the Herati pattern. The rich palette of blues, ivory, and greens set against the clear red ground also echoes classical Persian rug traditions. The main border has a delicate interlacing vinescroll pattern set against a navy ground for contrast, with finely articulated minor borders or moldings for added framing effect. 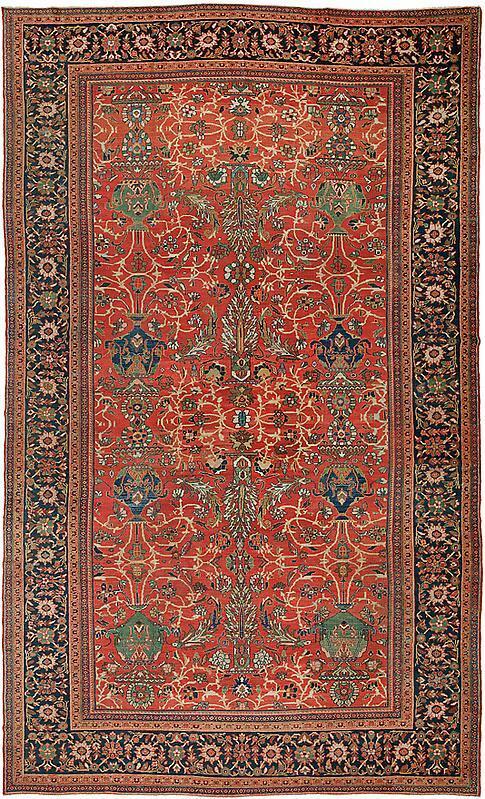 Even within the Ziegler or Sultanabad genre, this carpet is almost without peer.